Pain has often been called “the oldest medical problem.” While pain is a normal sensation that alerts the body to a possible injury, chronic pain persists for a long time — generally, more than three months. Chronic pain is sometimes caused by a single injury, such as a back sprain at work, a major surgery, or a traumatic car accident. It might also occur because of an ongoing issue, like a chronic illness or repetitive physical stress. In other cases, people experience chronic pain for no clear physiological reason. 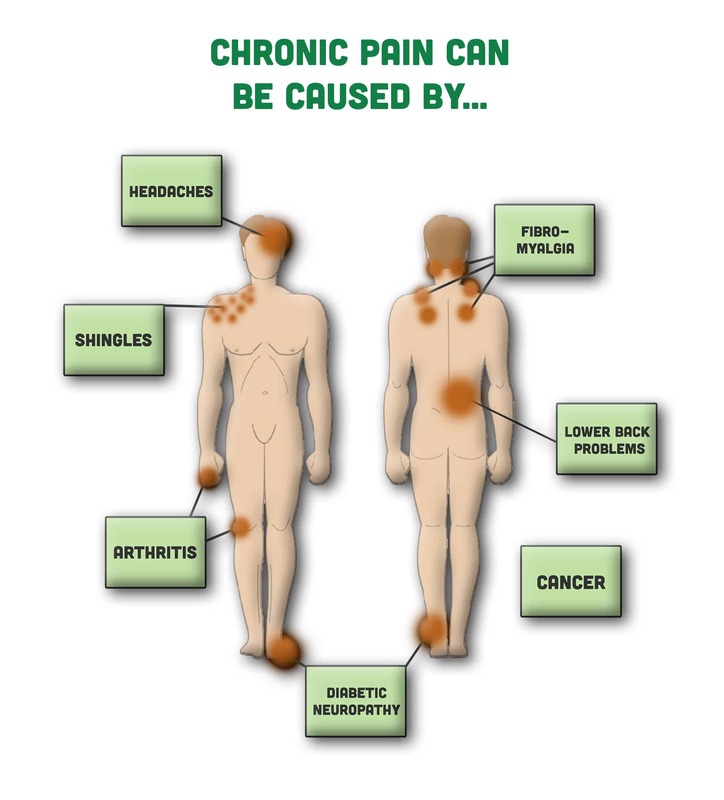 Lower back problems, arthritis, cancer, complex regional pain syndrome, repetitive stress injuries, shingles, headaches, fibromyalgia, diabetic neuropathy, and phantom limb sensation are among the most common causes of chronic pain. 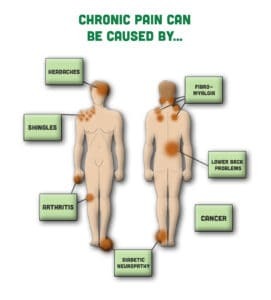 Chronic pain often accompanies other health problems. These include mood changes, difficulty sleeping, fatigue, and decreased appetite. It can also limit a person’s natural movements, which can affect one’s ability to complete routine chores, maintain employment, exercise, and get around their community. People with chronic pain are at an increased risk for depression and anxiety, both of which can lead to social isolation and other problems. Since pain can cause depression and depression can cause pain, the combination of the two can create a dangerous vicious cycle. People with chronic pain are also at a much greater risk for substance abuse and suicide. How many people are living with chronic pain? Some studies estimate that as many as one in four American adults experience chronic pain, making it the leading cause of disability in the United States. Certain groups of people are at greater risk for chronic pain, including: women, older adults, obese adults, people without college degrees, and people living in poverty. Those who work in blue collar occupations — especially in agriculture, forestry, construction, or other jobs that involve high levels of physical activity — are also at a higher risk for chronic pain. Considering many of these risk factors are common in the North Country, there is strong reason to believe that rates of chronic pain in our region are equal to or higher than those in other areas of the country. 1. Get screened to find out if you have, or are at risk of developing, a chronic disease or mental health diagnosis. If you already have one of these conditions, work with a healthcare professional to manage or treat your condition. 2. Explore alternative pain management options, such as physical therapy, massage, acupuncture, yoga, or others. 3. Take steps to improve the safety of your home, workplace, and community to help prevent injuries where you live, work, and play.